I really like The Well. It just edges as my favourite of the St John Street lot. More relaxed and friendly than the others. Some decent beers too. Really nice pub. For me it's definitely one of the best in Clerkenwell. Nice atmosphere and nice people. You can find places with more beers, but not a nicer atmosphere. Loads of tables outside too, which is great for peoplewatching when the weather's good. This is one of my favourites in Clerkenwell. It has a really nice atmoshere, and very friendly staff. There are tables outside if there are smokers with you, or if it's a nice day. 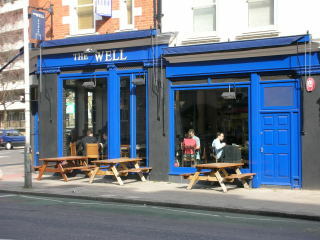 Some of the pubs nearer Farringdon station just get so busy and hectic, so I prefer The Well which is just away from all of that. It stays busy, but in an enjoyable way, not a frustrating way. They have some really nice beers, and a very good wine selection too. Great little place. Good selection of food and drinks, and is always busy. Nice outdoors area - covered with tables and heating, great for smokers. Excellent place for food and the downstairs bar is really buzzy on a Friday evening. Staff are always fast and friendly here.